The July MMMM asked solvers for a “well-known rock band.” The five theme entries all consist of two words. 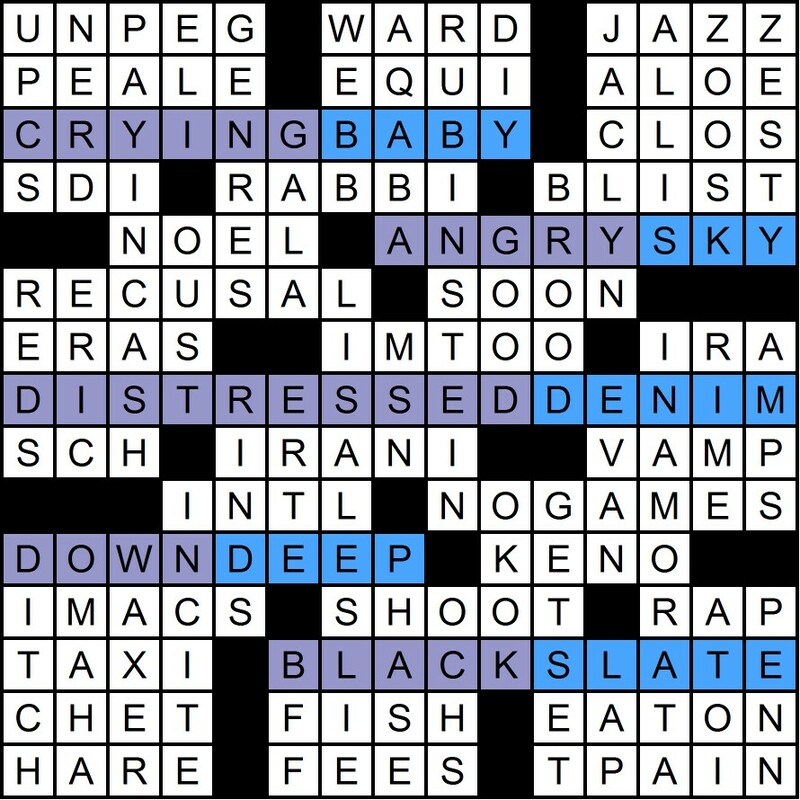 The second words are shades of blue (BABY, SKY, DENIM, DEEP, and SLATE), while the first words are types of moods (CRYING, ANGRY, DISTRESSED, DOWN, and BLACK). Put them together (as did 157 solvers this month) and you get the meta answer, the Moody Blues. The Moody Blues are British, and the title “Colour My World” hints at both England and the band name. A number of people submitted incorrect answers that captured the “blue” part of the theme answers: Blue Öyster Cult, Blues Traveler, and Blue (a British boy band I had not heard of) were the most popular. I also got a Blue Man Group (love those guys) and a Deep Purple. Due to a technical glitch, the Leaderboard didn’t update for the first two days of the contest, leading some people to believe that the puzzle was harder than it seemed. Sorry! cmsb705 My first meta after signing up last month. Hopefully I got it right! You did – congrats! patanga I remember seeing this group at the Oakland Coliseum in….sheesh…..1972? God, I’m old. You’re just getting started! Abide Alternate title: Sad but True? Love it! Maggie W I propose CRUSHED ICE as an additional theme answer. Nice! Norm H That is an astonishingly elegant meta — bravo! Thank you! deep purple and just when i thought i’d never be able to solve another mmmm til next january! thx for throwin’ me a bone! mathdanmom I was baffled by this one for quite a while. Finally the answer hit me like a bolt out of the…well, you know. Howard B Not in my Wildest Dreams did I think I would figure this out. Nice theme! arctan amusing that i solved this on Tuesday Afternoon. Mike W and ASB suggest cluing OMAHA as the Counting Crows song. imfromjersey suggests using the Golden Palominos song instead. And andeux suggests [City where the Top 40 radio format was invented] (I didn’t know that). Evan suggests cluing LISA LESLIE as [WNBA star name-dropped by Nicki Minaj in Ludacris’s “My Chick Bad”]. Not to be outdone, ASB suggests cluing EVAN as the Lemonheads’ lead singer. Solvers found this puzzle pretty easy, rating it an average of 2.8 on a difficulty scale of 1 to 5. The average rating was 3.94 stars out of 5. This month’s randomly chosen winner of an MMMM coffee mug is Andrew M from Oakland, CA. Thanks as always to Matt Gaffney for blogging the puzzle at Crossword Fiend, where you can rate the puzzle and/or leave a comment. No one has cracked the mega-meta as of the end of last month. I’ve received 11 incorrect submissions so far. Thanks for playing, and see you in August!